Falstaff, comic opera by Giuseppe Verdi, bursting with humour in each of its phrase, is back on the stage of the CNT Ivan pl. Zajc, namely, on Thursday 22nd November at 19 hours, on Saturday 24th November at 18 hours, as well as on Saturday 1st December at 18 hours. Check why is it that our theatre visitors proclaimed this opera staging to be the best one in the last season! Excerpts from critics’ reviews on this Falstaff: Top grade production that would be a shame to miss, comprising all that we need in these gloomy times, a lot of laughter and a noble moral; Multi-layered, witty, playful to the smallest detail, exuberant and overfilled with charge, in an innovative and pure direction; Surian’s splendid Falstaff, enchanting in this staging; Charm, performing brio and intelligence, rich vocal interpretation by Giorgio Surian; Joint performance of the wives of Windsor worthy of any relevant production in the world; Funny costumes by Sandra Dekanić; Top grade sound of the orchestra; The energy of the whole ensemble brings the audience to their feet, etc. 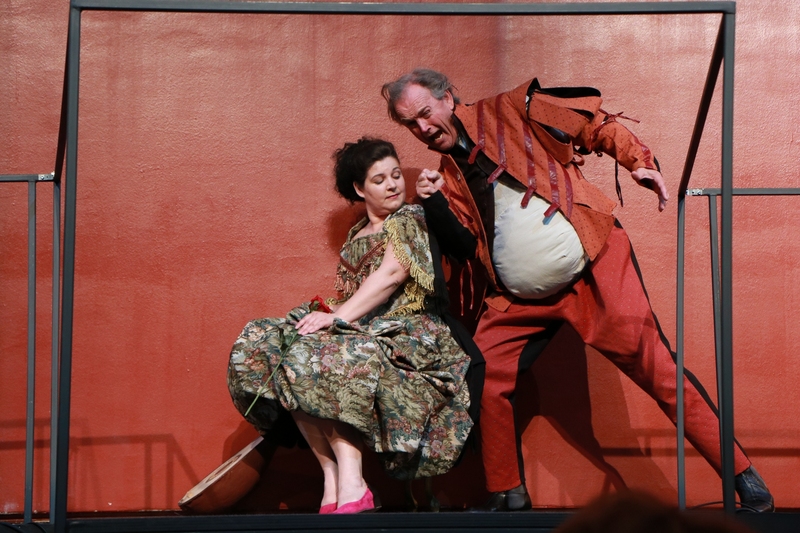 Created after Shakespeare’s The Merry Wives of Windsor, there is a series of hilarious events that follow each other in this Verdi’s last opera. Corpulent old knight Sir John Falstaff is plotting to improve his financial and love situation. He sends the same love letters to two richly married women, thus setting in motion the explosion of a comic and romantic chaos. In fact, he does not know that ladies Ford and Page are actually friends. When the ladies realize the plot, they will prepare a lesson for Falstaff that he will not be able to forget. Add to all this a jealous husband in disguise, a young couple secretly in love, double entrances, parallel crossings, a dive into the river, a costumed surprise attack of fairies, a great wedding feast and an unforgettable evening for you. Top production, impeccable sound, playful and imaginative direction rich with witty jokes, intensive collective play, funny costumes, national soloist Giorgio Surian as Sir John Falstaff, unsurpassable energy of soloists, great singers-actors, as Anamarija Knego, Vanja Zelčić alternating with Hana Hanas, Margareta Matišić, Ivana Srbljan, Robert Kolar, Aljaž Farasin, Sergej Kiselev, Marko Fortunato and Dario Bercich. The first two performances will be directed by Ville Matvejeff, while Maestra Beatrice Venezi is directing Falstaff in December. Marin Blažević is dramaturge-director, whose unusual directions breaks down all prejudices on opera. Selma Banich is choreographer, set design is by Marin Blažević and Dalibor Laginja, Sandra Dekanić is costume designer and Dalibor Fugošić designed lighting. Textual interventions have been made by Lada Čale Feldman and P. A. Skantze. If you would like to see this performance once again, keep your ticket that will entitle you to a 50% discount for your second visit to Falstaff. Joking is a man’s vocation. Whirling this way and that.